WE ARE PROUD TO OFFER THE WORLD'S MOST BEAUTIFUL AND STUNNINGLY REALISTIC ARTIFICIAL CHRISTMAS TREES THAT ARE CRAFTED WITH OUR SIGNATURE TRUE NEEDLE™ TECHNOLOGY AND EQUIPPED WITH ADVANCED LIGHTING OPTIONS. Christmas trees are our passion. We offer the widest selection of high-quality, realistic looking trees on the market. We do not purchase trees from brokers who, in turn, order trees from different factories and suppliers. Balsam Hill designs and produces each of our trees ourselves; we are one of the only Christmas tree brands that can truly say so. From a real treeï¿½s texture right down to the slightest colour variations, our attention to detail helps us create trees that are so unbelievably realistic it can be hard to tell them apart from the real thing. When you buy from Balsam Hill, you can rest assured that your tree has been hand-crafted with care to ensure quality and longevity. Our skillfully designed trees feature dense branches, durable branch tips, and power-efficient lights that together give our trees a rich, full look. From the asymmetrical branch design right down to the subtle colour differences and texture of our branch tips, you can see how our trees are designed to mimic the real thing. Guided by the great outdoors, our designers model the profile and branch tips of our trees from real evergreens. Our exclusive True Needle™ technology ensures that these trees have foliage carefully crafted to match the look and feel of your favourite natural trees. Balsam Hill's pre-lit trees provide the beautiful glow of LED lights on your tree without the hassle of tangled wires. Our Candlelight™ LED lights are power-efficient and give off a soft, warm glow just like a real candle flame as opposed to the harsh, cold glare of traditional LEDs. All our pre-lit Christmas trees feature lights designed specifically for the Australian customer - ready to plug in without needing to use a step-down transformer, and are professionally strung by hand to conceal unsightly wires from view. Whether your home is a humble studio-type flat or a larger three-bedroom dwelling, we have a tree suitable for your living space. With heights from 1.4m to 2.7m and widths ranging from slim to full, you can find the perfect tree to fit your home. We even have unique upside-down trees trees that can help add a twist to your holiday decorations. Check out our General Setup Video to see how easy it is to set up your Balsam Hill Christmas Tree. General Setup Video: Watch how easy it is to set up your new Balsam Hill Christmas Tree. In 2012, we established a local warehouse and customer service team in Australia and were amazed by the positive response we received from Australian customers. Because our trees are housed locally, the best and most realistic artificial Christmas trees can now be enjoyed down under. When you order a tree from us, you can expect to have it at your doorstep in as little as 2-3 days, depending on your location. Our local customer service team is also prepared to assist you with any delivery concernsï¿½promptly and professionally. See the Australia shipping guidelines for more details. Our knowledgeable local customer service representatives are available to help you find the best tree for your indoor or outdoor decorating needs. A local customer service team ensures that requirements specific to the Australian market are addressed appropriately. Please feel free to give us a call at 02 8046 6228 for design suggestions and any assistance you might need. 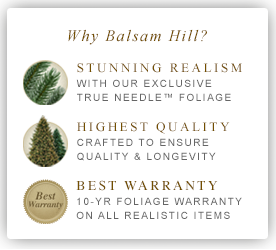 Balsam Hill™ is pleased to offer a limited three-year product warranty on regular and sale-priced artificial Christmas trees. The Balsam Hill Three-Year Limited Warranty guarantees the quality of our artificial Christmas trees’ factory installed lights (excluding burned-out bulbs), frame, foliage, hinges, and tree stand. Any repair or replacement of defects in those parts are fully covered by the warranty within the specified time frame. Please note this warranty only applies to artificial Christmas trees. All other products are covered by our Premium Guarantee. All clearance trees are covered by a 60-DAY CLEARANCE LIMITED WARRANTY.